Welcome to experience Kundalini yoga! Wonderful weekend with Kundalini yoga. Both beginners and advanced practitioners are welcome to the course. After the yoga classes you can swim in a seawater pool, enjoy salt therapy, light therapy and acupressure mat. 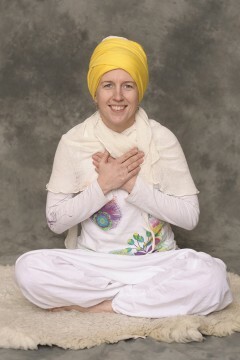 The yoga classes are conducted by Kaili Leht/Siri Atma Kaur! A short presentation of the teacher is available below. Yoga classes are held in Estonian and English in the Panoramic Room. •	accommodation on two nights in a twin room at the hotel, (extra fee 28 € for a single room). •	pools and saunas from 1 to 10 pm (3 hours). We suggest bringing your swimsuit and rubber beach shoes with you, to feel even more comfortable at us. The package starts at 3 pm on the day of arrival and ends at 12 am on the last day. NOTE! A yoga class starts, if at least 6 people have signed up for the class. Siri Atma Kaur is a grand and magnificent spirit. This name gives courage and skills to inspire other people in search of their soul and through that to achieve their peace of mind. I am a Kundalini yoga teacher in Lääne county and Haapsalu. I gained my knowledge from the Karam Kriya school of Kundalini yoga teachers in London. I guide classes on a daily basis in Lääne County and the Lahe yoga room in Haapsalu, I instruct athletes and schoolchildren. Yoga is my hobby, work and way of life. For me, Kundalini yoga is a key, which opens the heart and door to an enjoyable life. I invite you to Fra Mare Thalasso Spa on four weekends in a year to relax and practice Kundalini yoga, which is based on the teachings of Yogi Bhajan. Kundalini yoga is a form of yoga, which uses physical exercises, breathing, sound vibration, hand positions, body locks and meditation to enhance energy movement in the body. Kundalini yoga aims to improve the energy level of your body, open your creativity and bring you into contact with your true being. Kundalini yoga improves the glandular, nervous and immune system, blood and lymphatic circulation, brain, heart, lung and kidney function while removing toxins from the body. Kundalini yoga teaches to release and guide your energy. This is achieved not through perfect positions, but by getting to know yourself and acknowledging that you are exactly the way you are and that is good.